If you live here, we don’t need to tell you that summer in Chicago is fleeting. Let’s be honest to ourselves, patio days are numbered. We’re sorry, but someone had to say it. When it comes to ambiance and drink selection, there’s maybe no better patio than Three Aces in Little Italy. We’ve been here a few times and have actually never eaten inside. Because why would we? It’s the patio where you just want to hunker down for the afternoon. Which is sort of what we did a few weeks ago at brunch when the playlist was really killing it with 90s jams. 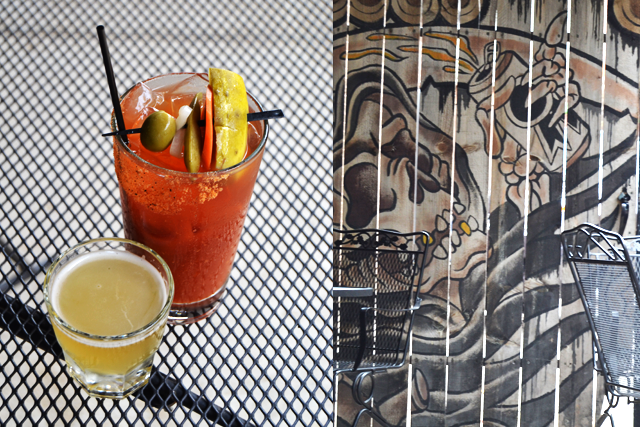 Three Aces is like your favorite dive bar. But actually nice. Rock ‘n roll murals meet flower planters outside. Dark but leathery inside. “The Italian countryside meets the American countryside…in Keith Richards’ basement bar.” Yep, pretty apt. 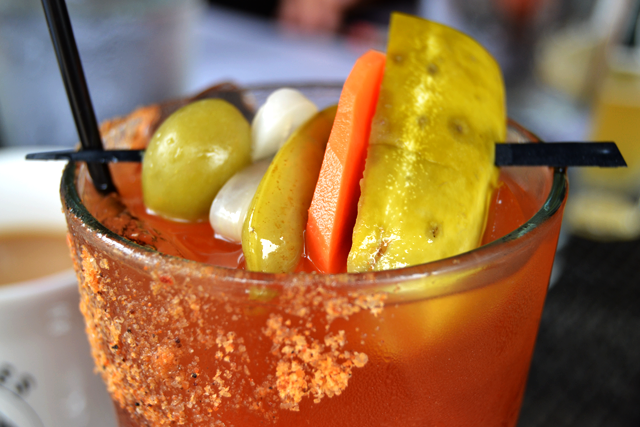 To be honest, the Three Aces’ bloody mary is pretty damn good, though it’s not earth shatteringly unique. Call it classic, if you will. A strong tomato flavor offset with horseradish and a bacon-chile rim. And the pickled veggies sort of make it feel healthy. Another thing we like about this bloody is that you get a sidecar of good, not necessarily cheap, beer. It switches out regularly, but was Allagash the day we visited. No one here is complaining. We plan on bringing a bigger purse next time so we can steal one of the coffee mugs. Just kidding (kind of). 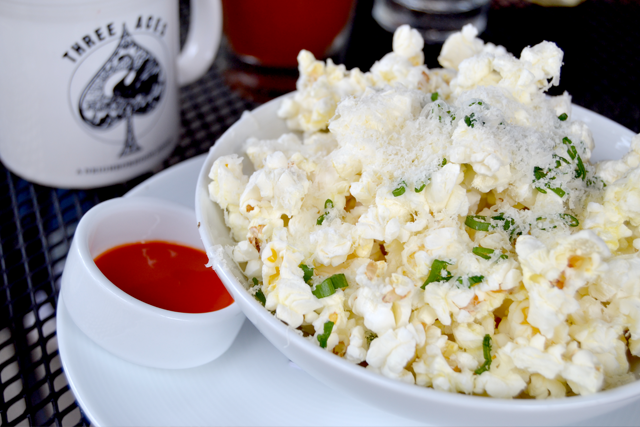 So we tried all types of food, starting with Parmesan popcorn with Sriracha dipping sauce. Your eyes aren’t playing tricks on you. That’s breakfast poutine. 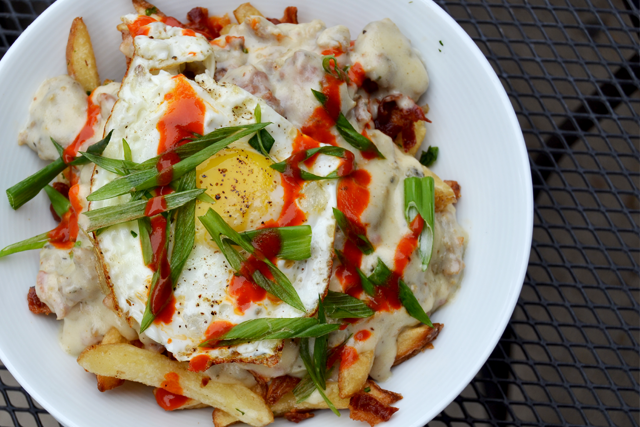 Fries with sausage gravy, bacon, fried egg and Sriracha. Order this, but prepare yourself for a food coma. 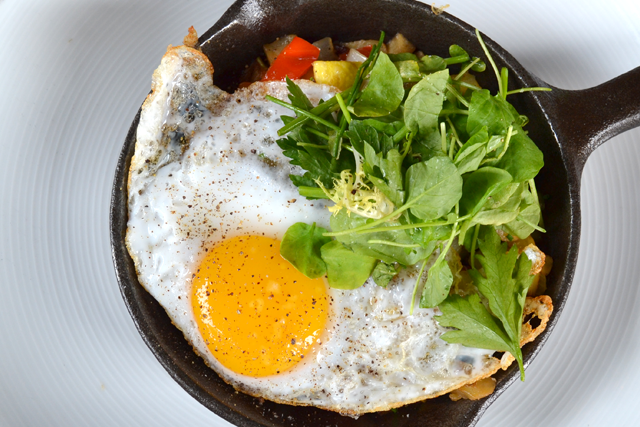 The farm egg sandwich and summer vegetable hash were also tasty and uber filling. 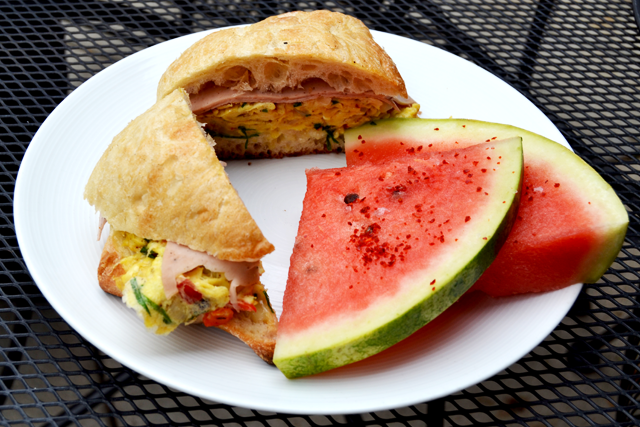 Well, go ahead and fit in one more patio brunch. We beg of you. To quote that show that one of us doesn’t watch but everyone else in the world does, “Winter is coming.” Cheers, friends.